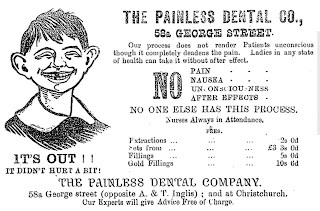 The Funny Fellows who Furnish Pictorial Political Cartoons to the Newspapers. 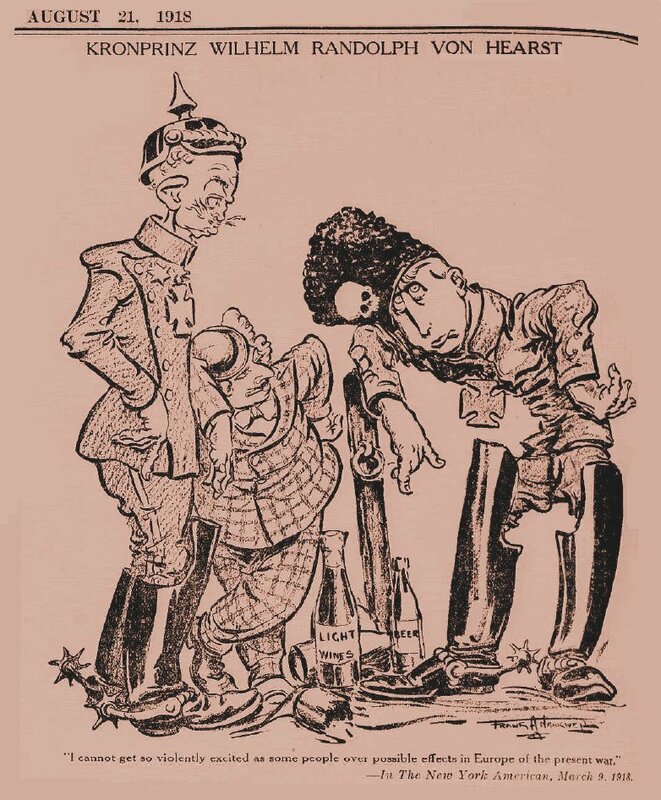 Although the modern cartoonist has not exactly pushed the spellbinder and the leader writer from the stool of chief importance, he has given these worthies a hard battle in the race for popularity and the victor is yet to be declared. The up to date reader now takes a glance at the cartoon in his newspaper as an appetizer for the elaborate details of the news column and the clinching arguments of the editorial page. A happy depiction of the subject of current interest is the great cartoonist’s forte. 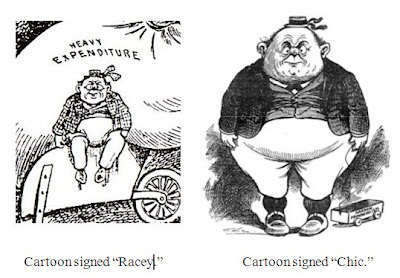 Since the days of Tom Nast, who did “Boss” Tweed to an untimely death with his little pencil, the cartoonist has been an indispensable feature of progressive American journalism. It was the popularity of the cartoon, a popularity due to Nast’s brilliant genius, which gave rise to the humorous weeklies printed in colors, and as Nast’s power waned, more for want of a subject than a lapse of energy, the public looked with longing for the appearance of Puck and Judge, with their rival cartoons from the hands of Keppler, Wales, Gillam and Opper. Opper, now one of the New York Journal’s staff, is among the last of the old school cartoonists, yet few of his admirers would admit that he is any the worse for that. His character studies fairly talk from the printed sheet, his tramps are redolent of trampdom, and his ward politicians seem ready to step out of the saloon and haul the reader up to vote straight. 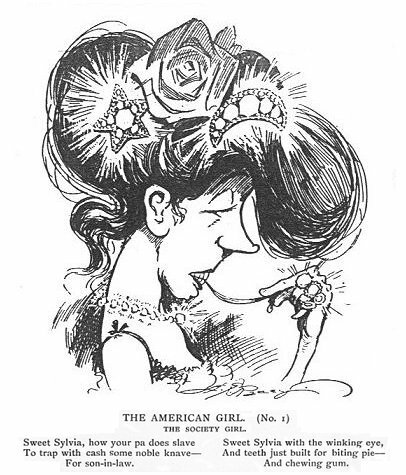 Frederick Opper was born in 1857 and began work for the New York papers at the age of 20. 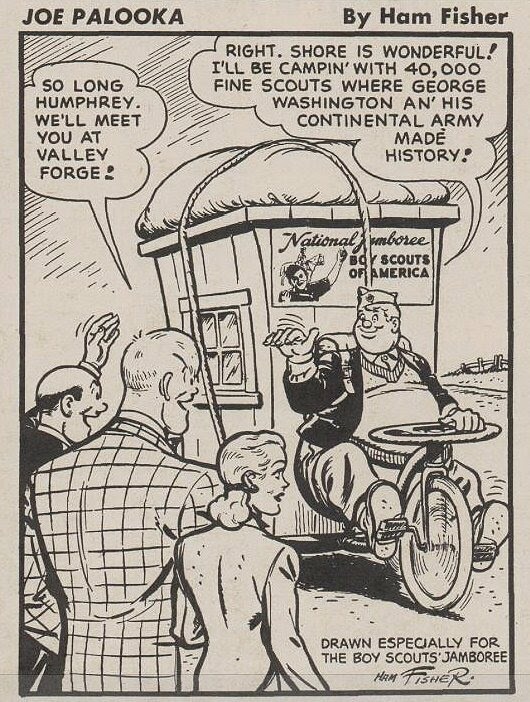 After doing comics for Leslie and Harper, he joined the staff of Puck, where his cartoons alternated from week to week with those of Keppler and Wales. 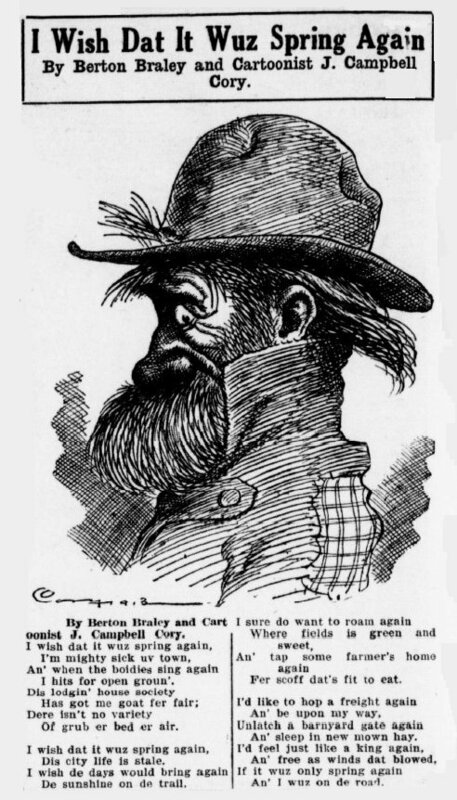 Homer Davenport, the westerner whom the New York Journal has been starring, is ten years younger than Opper and has been in journalism only eight years. Born and reared in a small town in Oregon, he had few advantages, and owes his skill to natural genius supplemented by hard work. There are judges who place Davenport at the head of the American cartoonists of today, but in any contest for honors in that field Mr. Pulitzer would beg to present as a rival the World’s well known artist, George Green Bush. Bush is a worker who at least did not come up in the irregular way. He believes that the cartoon should be an editorial in picture form, with a dash of humor thrown in. Before Bush found his element he studied art 3 years in Paris, and even after that was compelled to give lessons in drawing to make both ends meet in his little household, for while abroad he found an American girl courageous enough to marry a struggling artist. 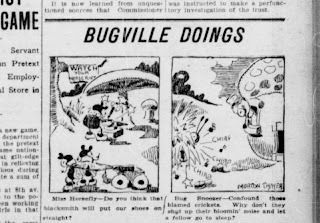 While drawing weekly cartoons for the New York Telegram Bush made a few hits that brought him fame. One of these was his “Klondike,” a powerful sermon against the lust for gold which even the religious papers copied. Then he gave David B. Hill the little hat, with its big streamer declaring “I am a Democrat.” Being well read in the classics Bush draws upon history and mythology, for characters and settings, while the main idea of the cartoon is often developed in a chance conversation or even worked up after the artist sits down to his task with the feeling that something must be done. “Study, application, and hard work” is his stereotyped advice to beginners who burn for fame and yearn for emoluments around the art sanctums of the New York press. The career of Charles Nelan, cartoonist of the New York Herald, is an illustration of the fact that the cartoon is an old feature breaking into a new field. The press is growing, and the cartoon is essential to the new development. 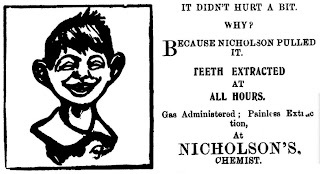 Nelan was an Ohio boy, and says that after losing several positions for drawing funny pictures, he concluded that drawing funny pictures must be his forte. 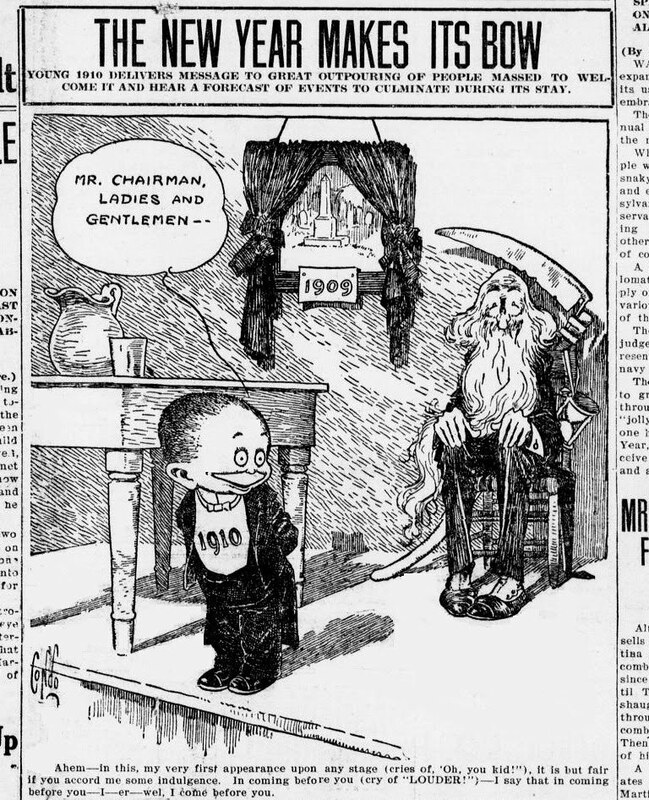 He made his first cartoon for a weekly paper published in his native town of Akron. 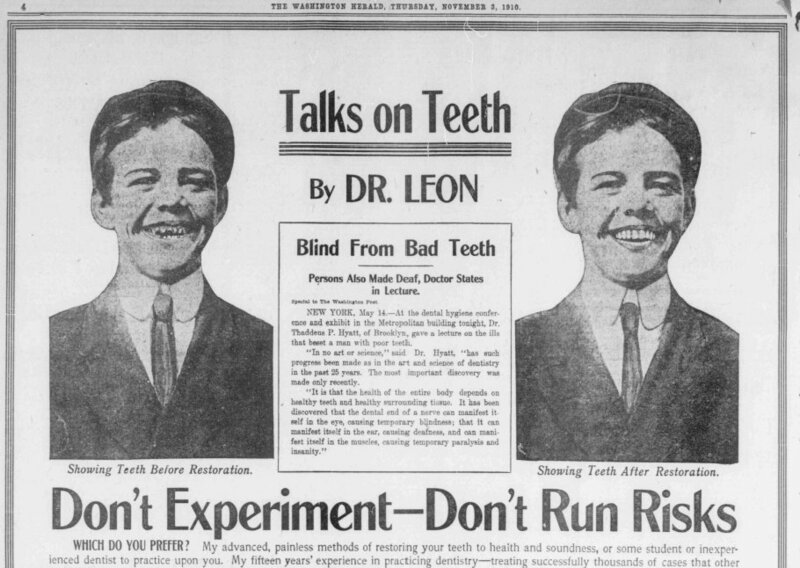 This drew the attention of Cleveland editors to the budding genius, and he got regular work there. Finally he engaged with a league of papers and manipulated the chalk in Cincinnati, St. Louis, Kansas City and Chicago, by which time his work was known in the east, and the Herald took him on the strength of his western reputation three years ago. 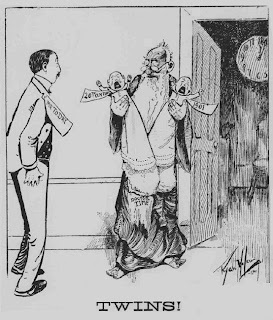 For a real free lance cartoonist one instinctively turns to Leon Barritt, now of the New York Tribune, hence a free lance no longer. Barritt, like Topsy, “just growed.” He began active life as a newsboy in his native town of Saugerties, N.Y. From selling newspapers to reporting, editing, and publishing was a natural step, but meanwhile young Barritt kept his eye upon art. He had learned wood and photo engraving, and, working at that in Boston for a year, returned to journalism and finally launched his bark upon the troubled seas of Gotham life as a contributor of cartoons to any paper which would buy. His name appeared regularly in nearly every daily of consequence, and, his ideas not being narrowed down to the requirements of a single sheet, his work had a wide range. 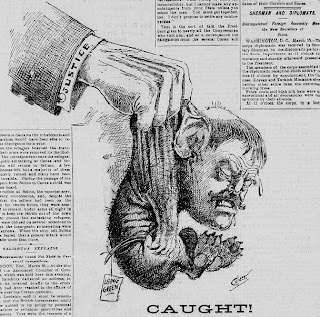 A newspaperman whose name is known to the public as a clever correspondent from the seat of war in the Phillipines and South Africa is John T. McCutcheon of the Chicago Record. His letters have been extensively copied, but it was only the accident of happening to be in the Pacific when Dewey sailed to Manila that caused him to put pen to paper as a journalist. He says that while at school in his native town of Lafayette, Ind., he developed cartoon symptoms, and they have stuck to him ever since. Crane, the Boston Herald man, is new to that paper, but his work is well known in New York, having appeared in the Recorder, now defunct; the World and the Herald. He was art editor of the Philadelphia Press four years and held the same position on the New York Herald two years. 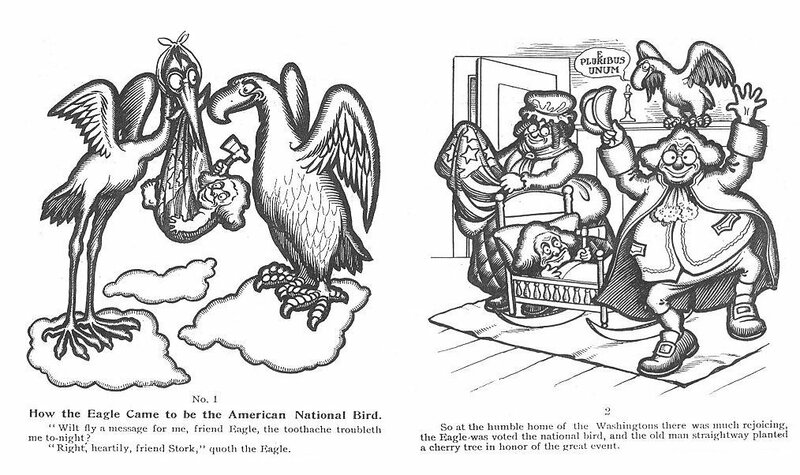 The traditions of life in America are rather reversed by the career of Felix Mahony, cartoonist of the Washington Star. Born in New York of cultured ancestry, he passed through school and college and began the study of art in Washington. Mahony is now 29 years old and has delighted readers of the Star with cartoons and caricatures for the past three years. A. J. 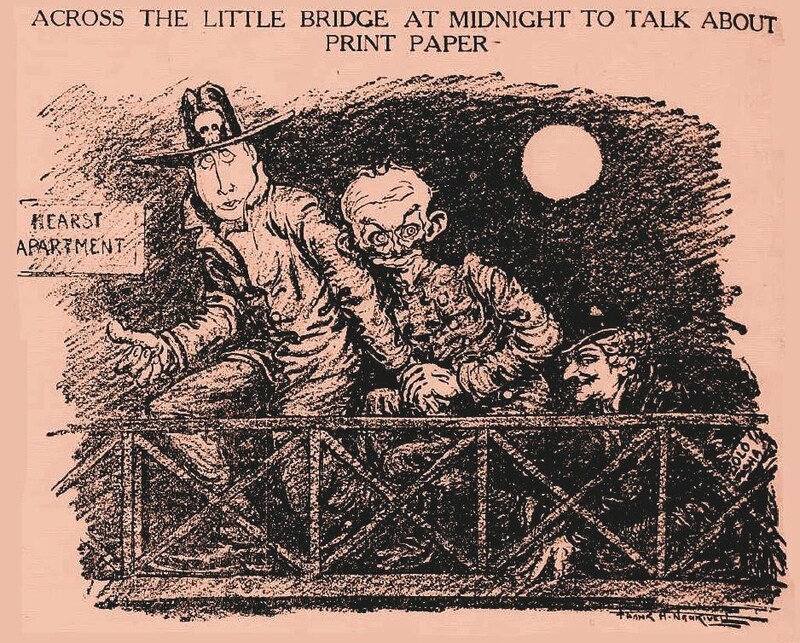 Van Leshaut now enlivens the Chicago Inter-Ocean with a pencil once devoted to rough caricatures of railroad men who came under his notice while a telegraph operator. Finally his contributions to the press were accepted, and he abandoned the key to become a cartoonist. After working 2 years on the staff of the New York Press he engaged with the Inter-Ocean. Ryan Walker, whose signature -- a black cat -- has become famous in the St. Louis Republic, where he is the all round “funny man,” is a Kentuckian 30 years old. He worked at everything from engraving to pork packing, from publishing to reporting, in order to study human nature. 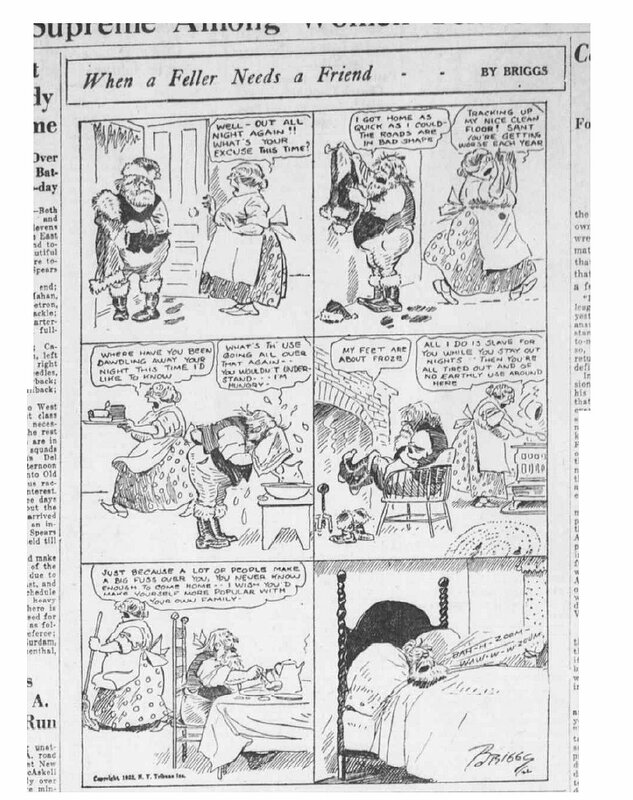 He turns out two or three cartoons a day as well besides managing the comic supplement and doing outside work. 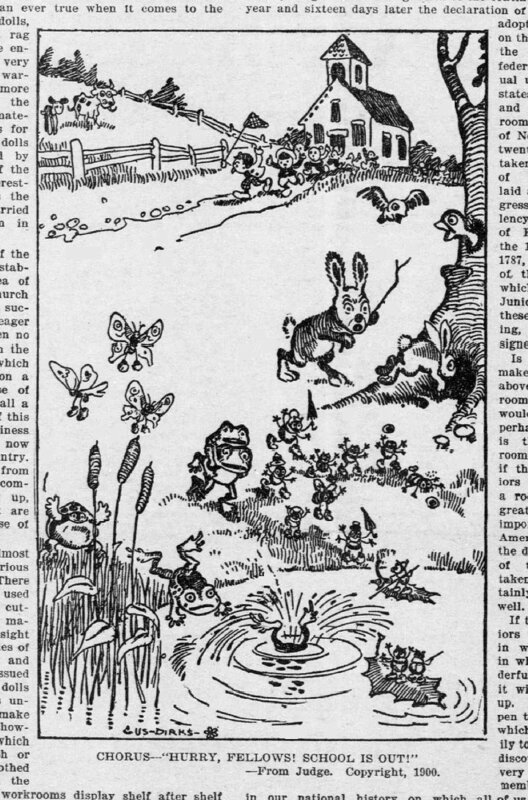 W. R. Bradford, who contributes an occasional cartoon to the Chicago Tribune, is a machinist by trade and a cartoonist by nature, having inherited skill with the pencil from his father. Hedrick of the Globe-Democrat has had a varied career as a self-taught newspaper artist. He emigrated from the Texas prairie to the St. Louis sanctum three years ago. 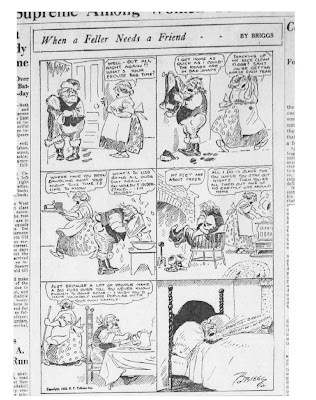 “Donnie,” J. H. Donohey, of the Cleveland Plain Dealer, began work as the “devil” of the Ohio Democrat and by hard study has won a reputation for high art in his cartoons. A glance at a cartoon signed “Bart” (C. L. Bartholomew) in the Minneapolis Journal is like a hasty survey of a well ordered dinner table; the beholder is conscious of being up against a feast, details of which may be left for future investigation. 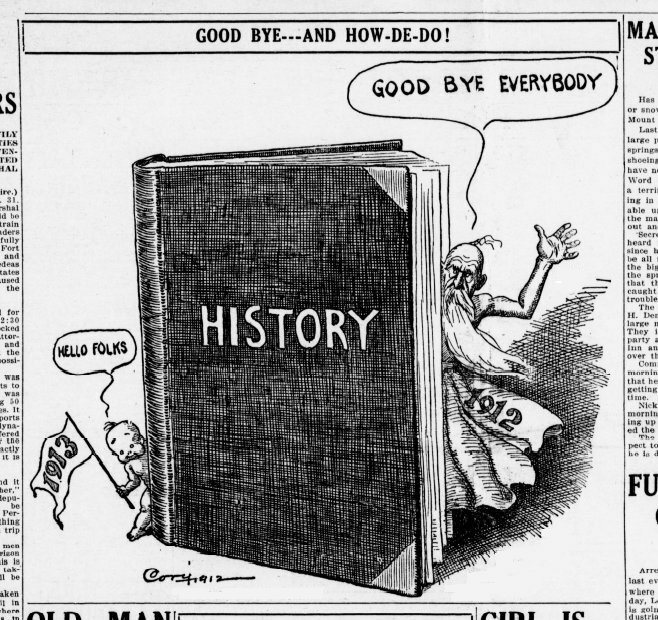 He is the pioneer cartoonist of the northwest, and the Journal set the pace in the matter of printing a daily cartoon. Harper’s Weekly clings to the feature which made it a power in the fight against Tweed thirty years ago. 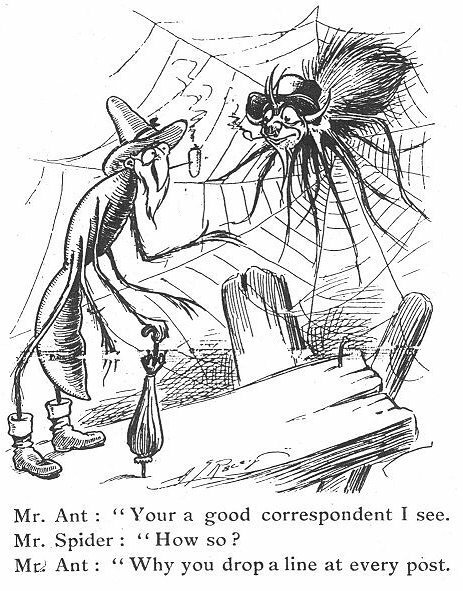 The cartoons now appearing in that journal are the work of one of the editors -- W. A. Rogers -- who, like Opper, is something of an old-timer. Rogers worked on the Daily Graphic in the seventies. He made a hit with a political cartoon in the Garfield-Hancock campaign, and his pencil has never since been idle. He is an all round illustrator for the weeklies and magazines. Miller P. Culver in the Deseret Evening News, Saturday, 20 October 1900. Yeah, beat it, old man, we're tired of you. 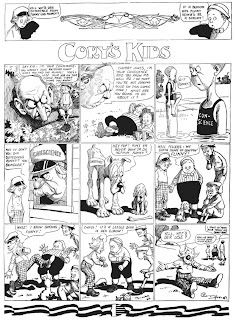 This is my fourth post on Katzies artist J. Campbell Cory, an under appreciated Platinum era cartoonist. I have updated an early biography with much new material HERE. Hammond Edward Fisher, salesman and self-taught cartoonist created prizefighter Joe Palooka during the Depression. 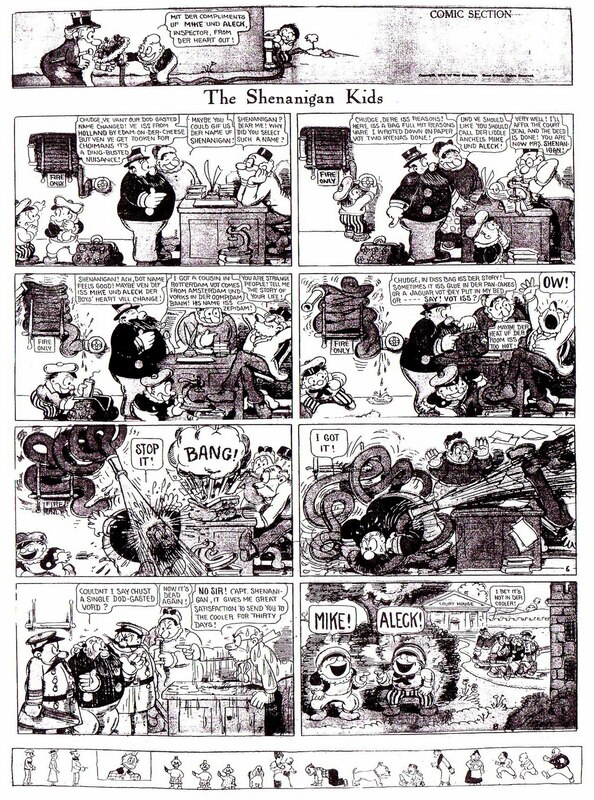 At time of his death in 1955 Palooka was appearing in 800 newspapers in the United States and Canada. 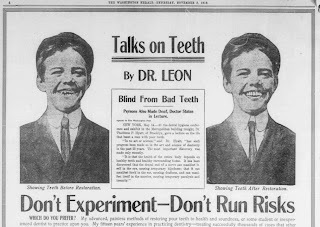 Fisher, born 24 Sept 1900, or 1901, left school at 16 and became a truck driver and brush peddler, before landing a job as reporter and advertising salesman for his hometown newspaper the Wilkes-Barre (Pa.) Record. Fisher claimed he had first come up with the idea of Joe Palooka in 1921, originally calling him Joe the Dumbbell. 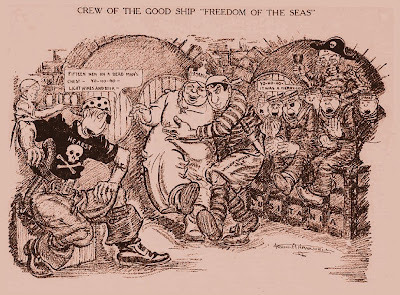 Fisher was employed by Captain Patterson’s New York Daily News, but the job did not help him sell Joe Palooka, the Captain turned it down, probably because Fisher was not a very accomplished artist. However, the story goes, in 1929 Charles V. McAdam, of the McNaught Syndicate, allowed Fisher, at no salary, to sell Palooka to editors along with Dixie Dugan. He proved successful enough that Palooka was finally accepted for syndication. That was Fisher’s usual story to reporters, probably best taken with a grain of salt. Fisher left an estate of $2,500,000 behind at the time of his death in 1955. Fisher was very patriotic and before the war Palooka joined the French Foreign Legion. During World War II Joe Palooka was fighting the Nazi’s in comic strips and comic books. 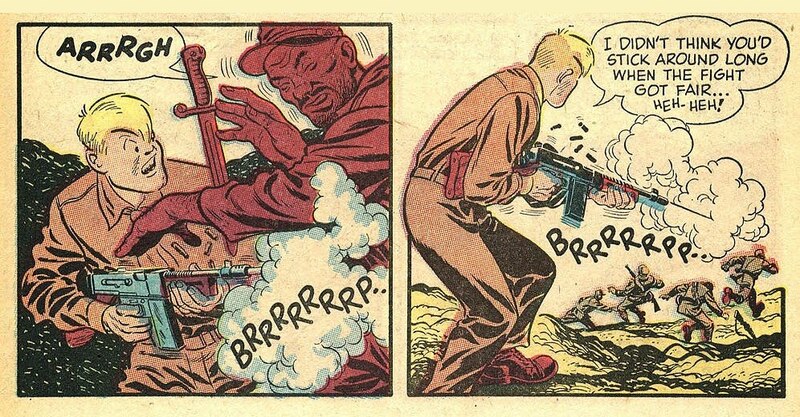 In the fifties Joe Palooka was the star of Harvey Comics bloodthirsty Korean War line. 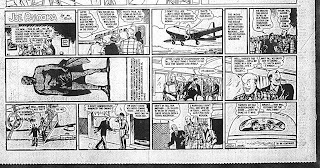 Real celebrities made their appearance in the comic strip; Jack Dempsey, Joe Louis, Bob Hope, Al Jolson, Harry Truman, and Franklin D. Roosevelt. 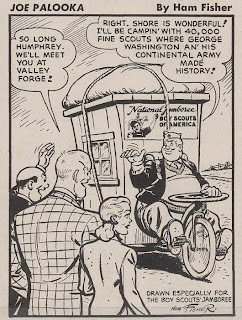 In 1933, according to Fisher, cartoonist Al Capp “begged me for a job…I took pity on him and gave him a job lettering and inking-in.” When Fisher was about to take a week’s holiday Capp demanded a raise of fifty dollars “and sneered that I wouldn’t be able to go away if he refused to work. I blew up. 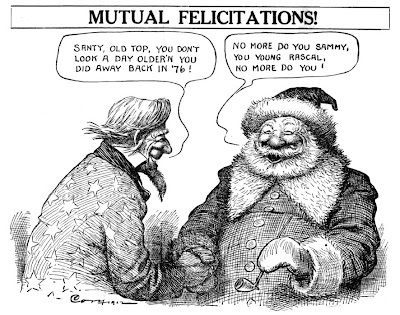 I fired him and took the work with me.” Thus began a feud that tried the patience of friends of both cartoonists. Al Capp rejected Fisher’s version of the feud. “Fisher’s wrong when he says I was hired to ‘letter’ for him. I was an artist -- good enough the year before to do a syndicated cartoon for the associated Press called Mr. Gilfeather. Fisher would have been a highly impractical man to restrict a competent artist and writer to simple lettering. Fisher cannot draw at all, except for a few simple chalk-talk tricks, so when he says ‘he took the drawings with him’ it is a pathetic claim. I never told him Joe Palooka was my favorite strip. It’s the kind of strip I deplore, a glorification of punches and brutishness. 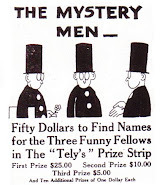 When Capp left Fisher hired three assistants, Moe Leff (stolen from former assistant Al Capp), Phil Boyle, and a lettering man, all of whom worked for him for over twenty years. Moe Leff helped with the continuity scripts and all three collaborated on the drawing. Fisher concentrated most on advertising the strip and himself, briefly branching into radio and movies. Ham Fisher, after first phoning his mother one last time, committed suicide by overdose in Moe Leff’s studio, 27 Dec 1955. According to his suicide note he was distressed by failing eyesight and diabetes. In 1950 Joe Palooka appeared in 30 Canadian newspapers, three in Montreal alone, and was second in popularity to only Blondie and Li’l Abner. Palooka raked in millions from comic books, candy, and ‘seven dozen’ Palooka movies. Indian Lookout in Wilkes-Barre was renamed Mt. Joe Palooka, and a 30 foot tall limestone Palooka statue (in a Superman type cape) was raised on a hill overlooking Route 37 in Indiana in September 1948. Joe Palooka was continued by Moe Leff, then Tony DiPreta, until its demise in 1984. *Most Quotations from “Joe Palooka, Richest Pug in the World,” by James Edgar, Maclean’s Magazine, Canada, 1 August 1950. Albéric Bourgeois, comic strip artist, columnist, musician and composer, was born 29 November 1876 at Montréal and died 17 November 1962. 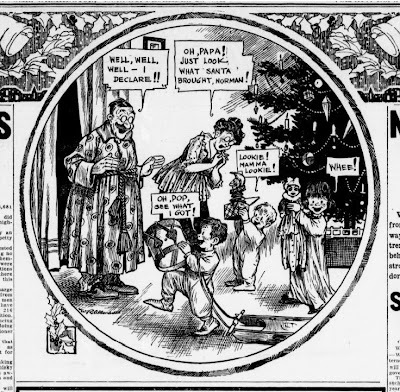 Bourgeois studied art in Montreal then moved to the United States where he worked as a newspaper illustrator and drew the English-language comic strip “The Education of Annie,” for the Boston Post. He worked on the strip from 1900 to 1903, then went home and was employed by Montreal’s La Patrie, where he worked drawing comic strips from 1903 to 1905. 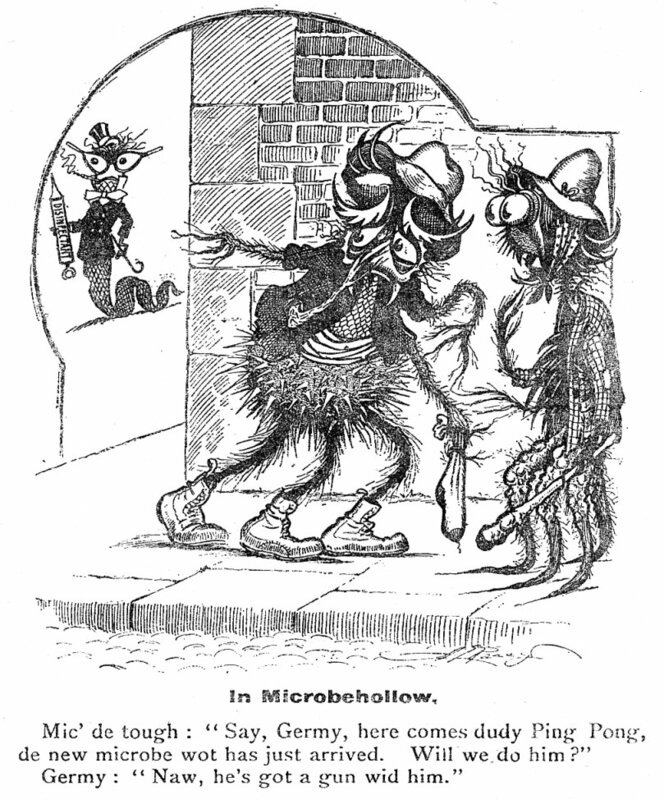 Bourgeois created the series Des aventures de Timothee a la famille Citrouillard (The Adventures of Timothy) in 1904, with word balloons replacing the usual captions of newspaper comics. He drew dozens of other strips for La Patrie, one called Les chroniques de Baptiste et de Catherine, featuring the Quebec everyman, Baptiste. Alberic Bourgeois then joined the daily newspaper La Presse in 1905 and stayed until his retirement in 1954. He illustrated Les voyages de Ladébauche, published in Montréal: A. & N. Pelletier, (191?) 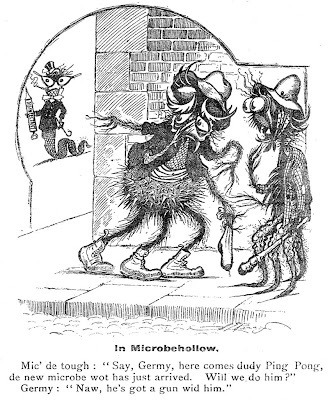 and Joyeux propos de Gros-Jean; petits monologues comiques en prose rime, by Régis Roy (1928). A slim book, Albéric Bourgeois, caricaturist (Montréal-Nord : VLB), was written by Léon-A. Robidoux, with prefaces by Normand Hudon, and Robert LePalme (1978). Gus Dirks “Bugville” cartoons first appeared in the comic periodical Judge, then, when Dirks took employment with the Journal, on the funny pages. When Dirks took his own life on 10 June 1902, “Bugville” cartoons by Dirks were reprinted until 1906. 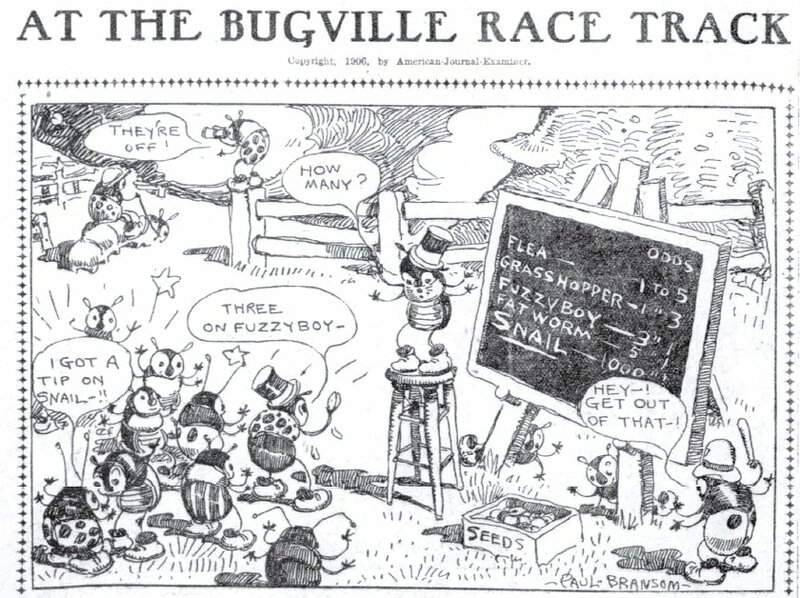 Another artist from the comic magazines, Paul Bransom, drew “Bugville” cartoons through 1906. 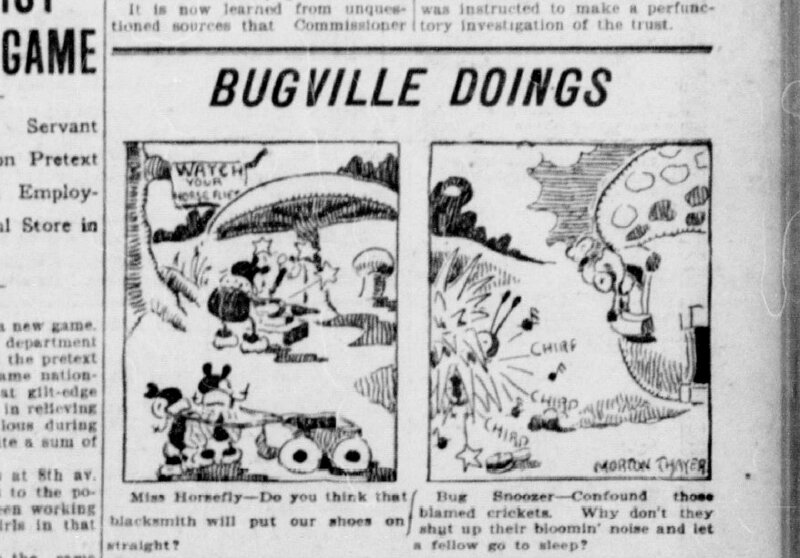 A more obscure artist was Morton Thayer, who drew a one-panel called “Bugville Doings” in the Seattle Star in 1906. 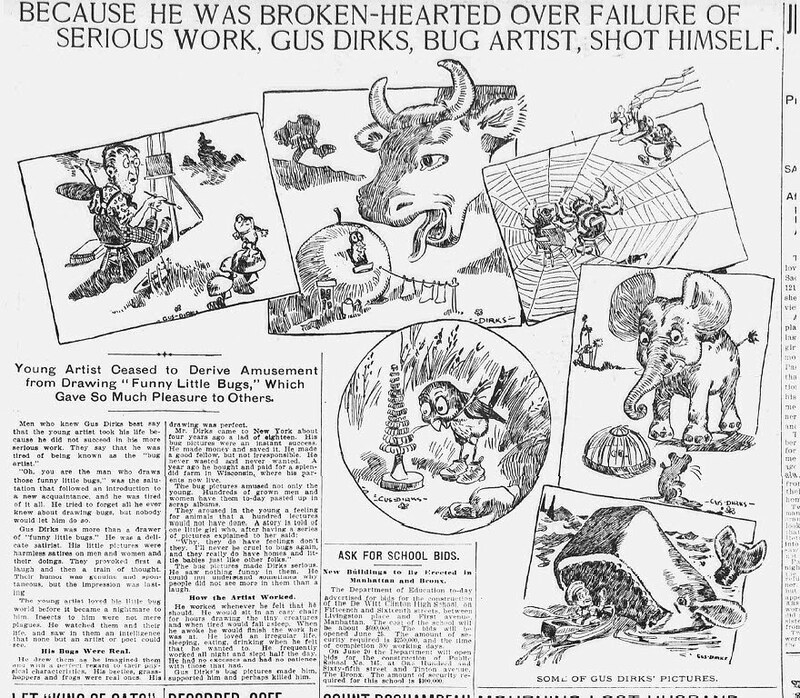 More on Gus Dirks HERE. Crooked Politician Long Green by Culver. Below William Randolph Hearst's 'New Journalism' in the Examiner, as pictured by San Francisco Call cartoonist Culver in 1896. Culver often resorted to a simple means of drawing various miscreants who fell afoul of the editors -- he drew them as polecats. The 'Life' cartoon may be by a different cartoonist since its unsigned. 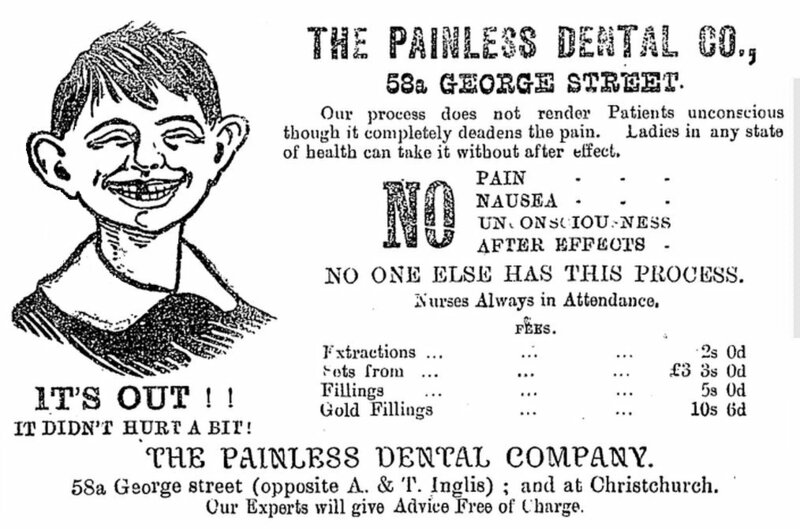 "It Didn't Hurt a Bit" Kid, Top 1 Dec 1903, Bruce Herald, New Zealand, bottom three illustrations:10 Sept 1904, Observer, New Zealand, 23 Jan 1907, Feilding Star, New Zealand, Dr. Leon's Painless Dentistry, Washington, D.C., 10 Nov 1910. See my previous post Mysteries of Melvin HERE. 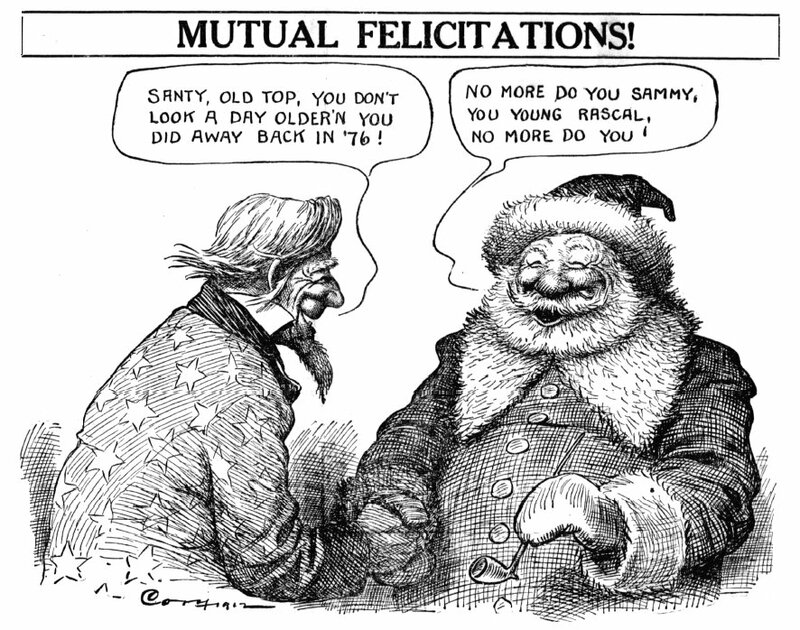 Top, Walter Allman 25 Dec 1916, , Brigg's Santa, 25 Dec 1922, and John Campbell Cory, 25 Dec 1912. 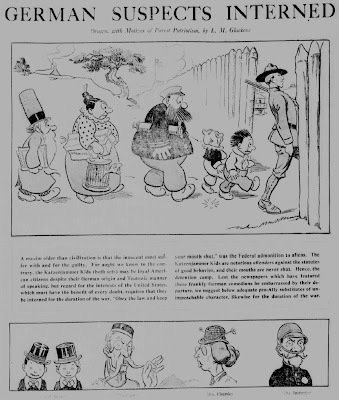 New York Tribune cartoon by Louis M. Glackens (1866-1933) , April 15, 1917. Shortly after this cartoon appeared the Katzenjammer Kids became Dutch citizens re-named the Shenanigan Kids, Mike and Aleck. 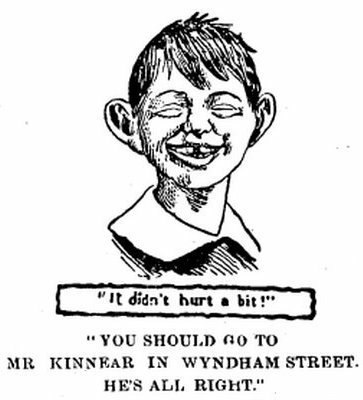 See more Shenanigan Kids by John Campbell Cory HERE. 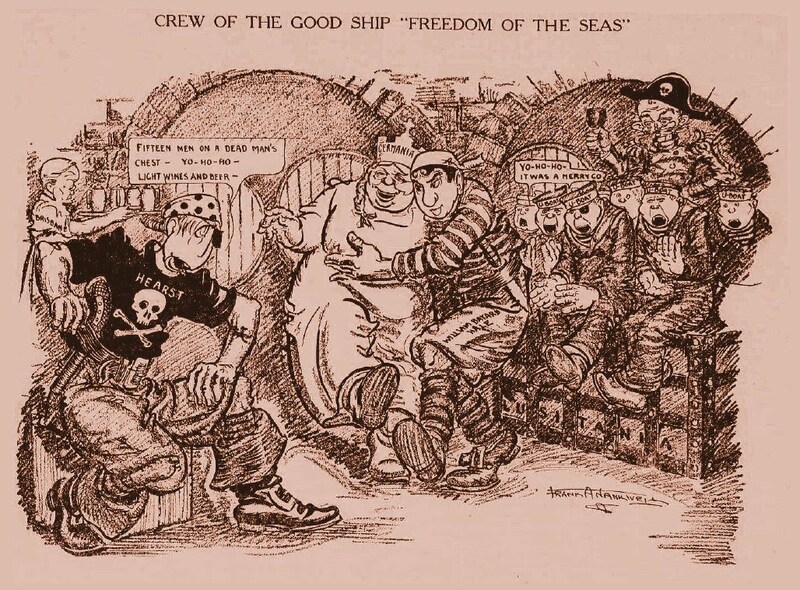 I continue my series on propaganda in World War I with the story of a different type of propaganda; propaganda on the home-front against a native-born American. 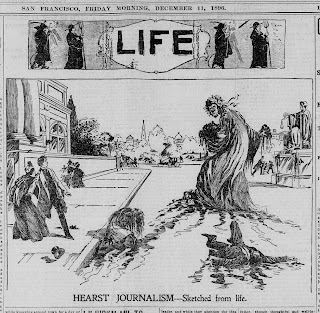 Between 1914 and 1918 William Randolph Hearst was public enemy no. 1 in all the Allied countries. 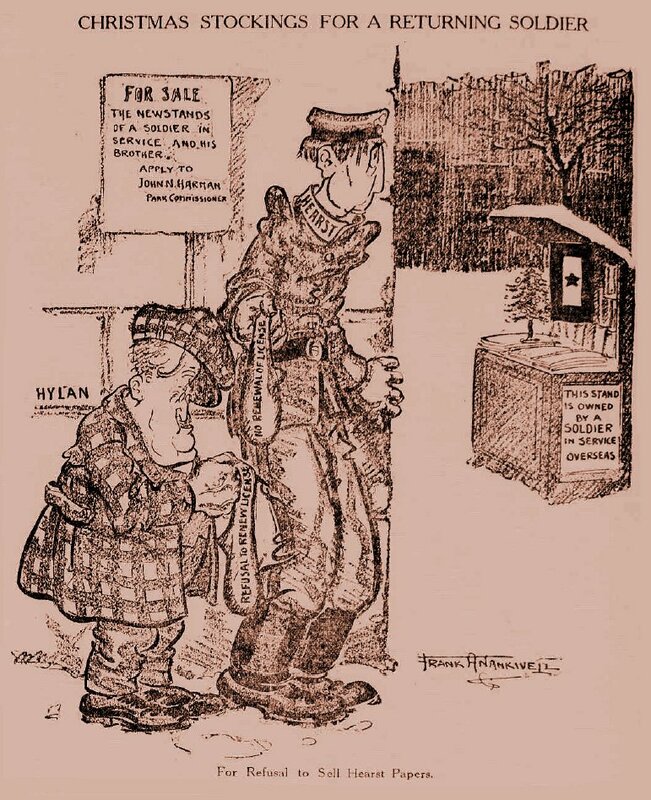 By 1916 Hearst’s long record of opposition to an Allied victory against Germany resulted in the banning (in 1916) of Hearst’s International News Service, and all Hearst newspapers, in France, England and Canada. Only Hearst’s comic supplements continued circulating in Canada. In February 1917 British Intelligence passed on a decoded telegram from Arthur Zimmerman to his Ambassador to Mexico and on 2 April 1917 the United States declared war on Germany. “It is not a very difficult thing to intern an enemy alien who ventures to reflect on our war attitude. It is safe and easy to assist in the tracking down of a spy who is a citizen of an allied country. There is comparatively little rumpus when a native citizen, who is also a member of the I.W.W. or of the majority faction of the socialist party, or who edits a small and ultra-radical magazine, comes into collision with the espionage act. An American millionaire is another matter -- he is a figure that will, apparently in the nature of things, be left alone so long as he doesn’t supply unquestionable, continuous and invariable evidence of disloyalty. 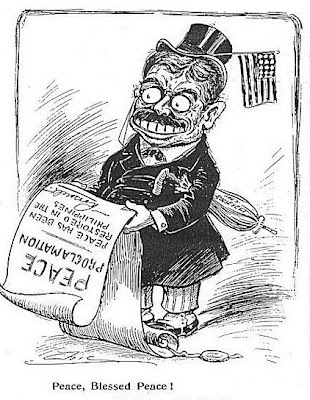 On 28 Jun 1918 Colonel Theodore Roosevelt, who the Tribune would have preferred to prosecute the war, over Woodrow Wilson, sent thousands of pages to the Senate denouncing President Wilson, Secretary Baker, Postmaster General Burleson, and the Hearst newspapers, which were printed in the Congressional Record. Hearst was not intimidated, he answered back with a paid advertisement titled Mr. Hearst Answers Colonel Roosevelt, in which he claimed that “From the very first day of the war the Hearst newspapers have believed that victory would be won by the united effort and energy of all our people, and not by the fault-finding and bickering of all our people,” and listed all the things that he had done in aid of the war. Among his many accomplishments Hearst created and manned recruiting stations throughout the Union and the President’s messages were printed in color and furnished gratis to Government departments, Department of Education, New York Public Library, and the Y.M.C.A. Hearst and his employees subscribed half a million dollars to Liberty Loans and fifty thousand dollars to the Red Cross. 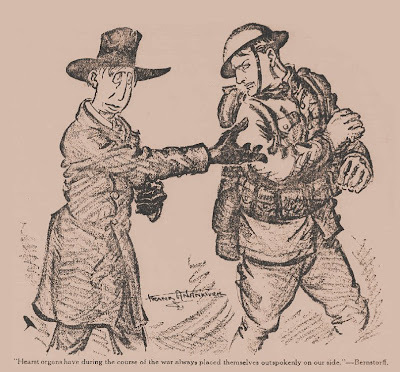 “As far as I can see, Mr. Roosevelt has done nothing but savagely and sensationally attack the president of the United States and his Cabinet during this critical war period, and has done this for partisan political purposes and, what is worse, for pay. 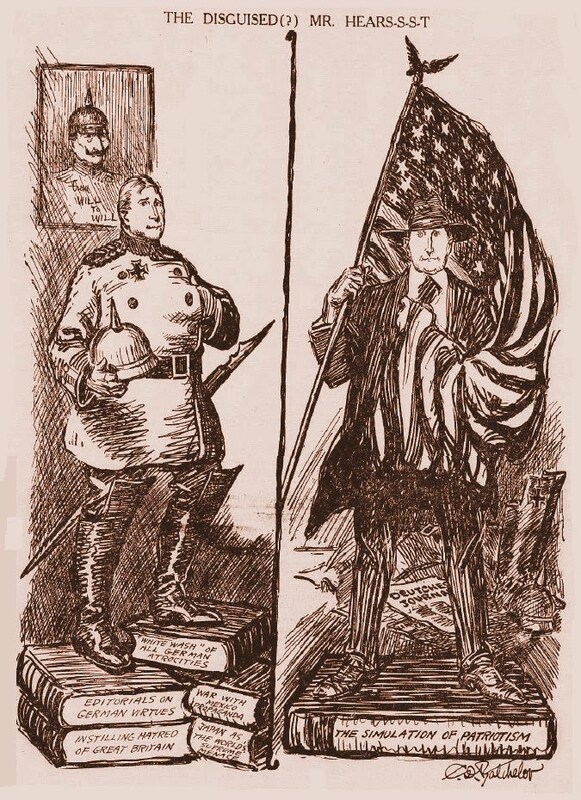 As far as I can see, one of the main objects of Mr. Roosevelt’s latest furious attack on the Administration was to aid and advertise those magazines and newspapers which pay and support him and to reflect upon those magazines and newspapers which do not hire him or admire him. As far as I can see, no matter what the motive of these continued attacks may be, whether it be partisan and personal, or well intended and merely misguided, the result can only be harmful to our Government, harmful to the spirit of our people, harmful to the morale of our armies, harmful to our country and our country’s cause. Despite Hearst’s championing of Woodrow Wilson the admiration was not reciprocated. 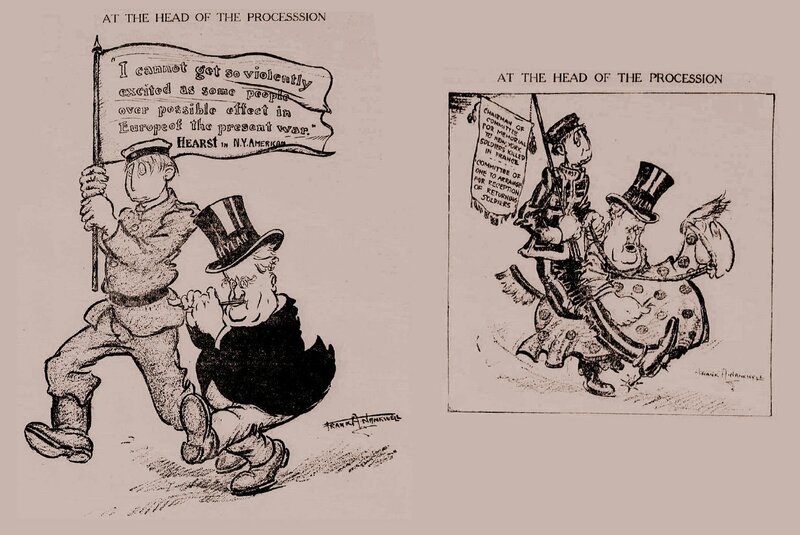 Wilson shared Roosevelt’s belief that Hearst’s attitude to Great Britain and Germany was suspect. 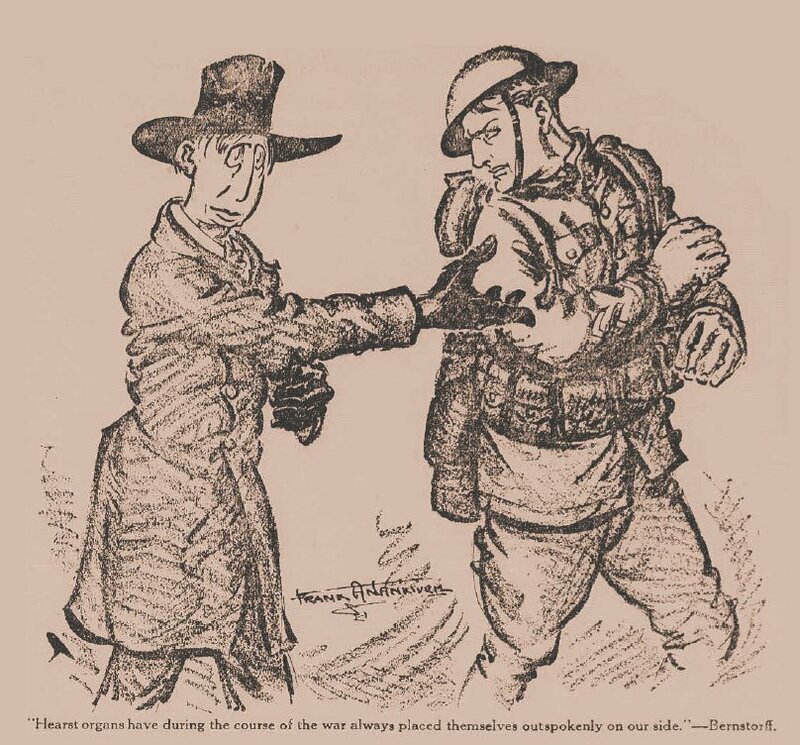 The New York Tribune began a cartoon war against Hearst on June 30, 1918, with a caricature of Hearst by Kansas cartoonist Clarence Daniel Batchelor, and continued through 10 Dec 1918, when a Senate hearing on German Propaganda read Hearst’s private telegrams into the record. One of them, signed “Doctor,” was addressed to S. S. Carvalho at the New York American. This telegram, purportedly written by Hearst, declared the “famous” Zimmerman telegram was “probably a forgery,” more damning, the forgery was prepared by the Attorney General. Dozens of Hearst’s telegrams were posted in the Hears-s-s-s-t articles on 11 December. Much of the material was supplied by the Attorney General’s office with encouragement from Washington. 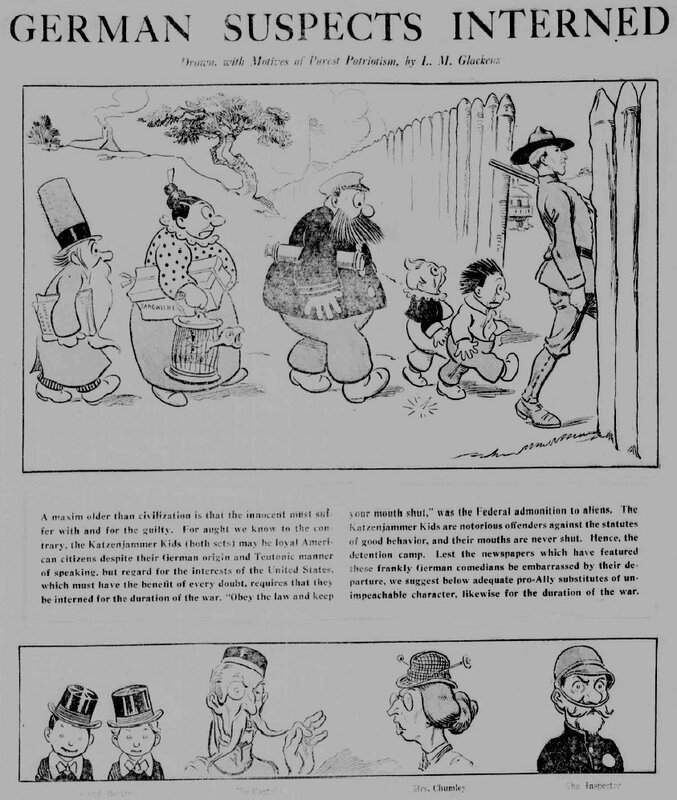 One cartoon by George W. Rehse was reprinted from Pulitzer’s New York World, showing that the Tribune was not alone in attacking Hearst’s patriotism. 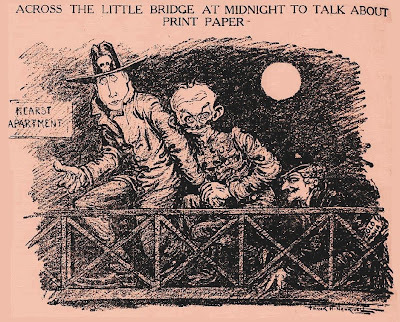 Frank A. Nankivell drew the majority of cartoons starting on 15 August 1918 with the cartoon captioned “Across the Little Bridge at Midnight…” Nankivell was just feeling his way into the character. He soon evolved an oddly appealing caricature of Hearst that was visually arresting; a gangly-bodied pie-faced pro-German with a skull on his hat. 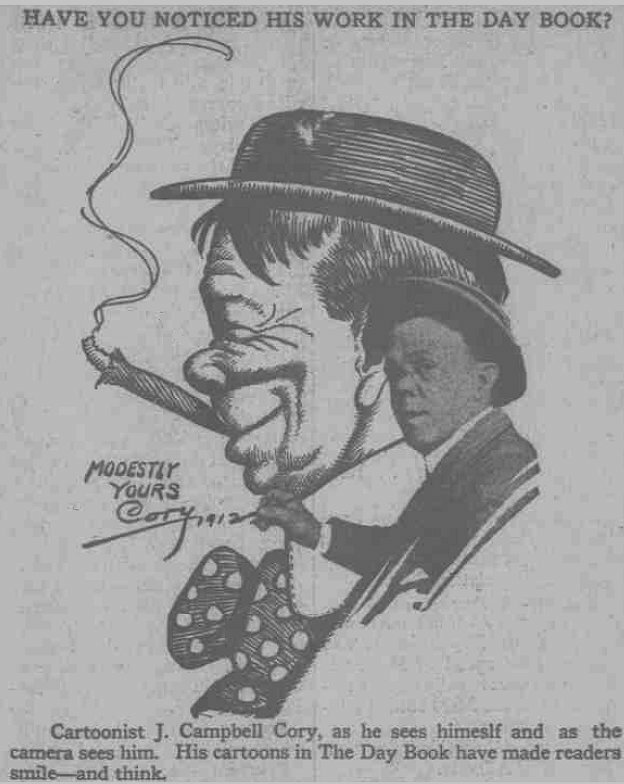 Other characters appeared in the daily cartoons; Hearst’s tubby sidekick New York Mayor John F. Hylan, who served from 1918 to 1925, and various German spies. 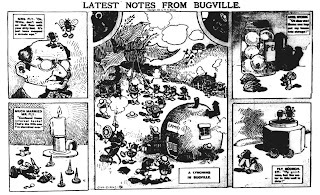 A few times Nankivell borrowed cartoons from Winsor McCay “with apologies,” and reworked them to show Hearst in a bad light, but they were uninspired compared to his vicious originals. 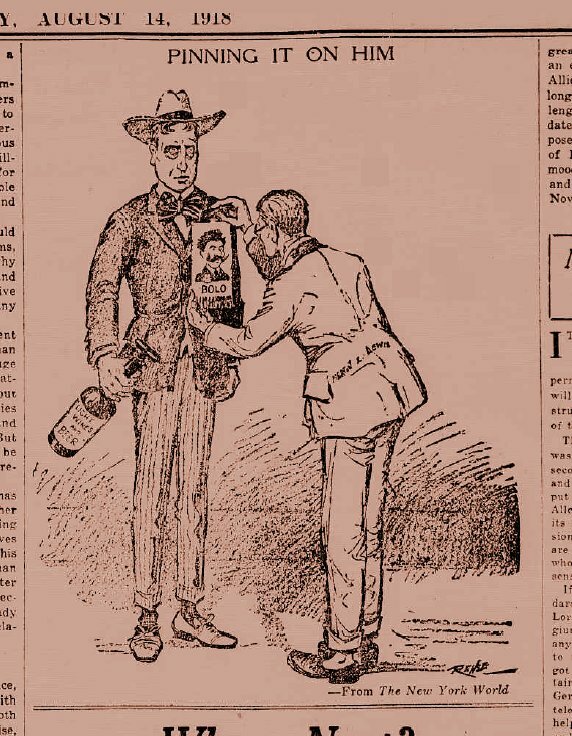 Under Nankivell’s skillful hands Hearst became a recurring character in a cardboard drama. Frank A. Nankivell, known to his friends as “Nankey,” was born at Maldon, Australia in 1869 and attended Wesley College in Melbourne, studying architecture and engineering. He was employed by the railroads until 1891, contributing drawings to various Australian publications. In 1891 he set sail for France, intending to study art, but ended up in Japan where he worked as a cartoonist for the English-language Box of Curios. Nankivell taught editorial cartooning to Rakuten Kiazawa, who went on to found the comic journal Tokyo Puck. In 1894 Nankivell moved on to California where he published and illustrated a short-lived comic paper called Chic, and contributed caricature and illustrations to the Examiner and the Chronicle. On the failure of Chic he was employed by the San Francisco Call, drawing mostly editorial cartoons. His work caught the attention of the proprietors of Pulitzer’s New York World and he was offered a position on the staff. His stay on the World was short-lived and he moved on to Hearst’s New York Journal. 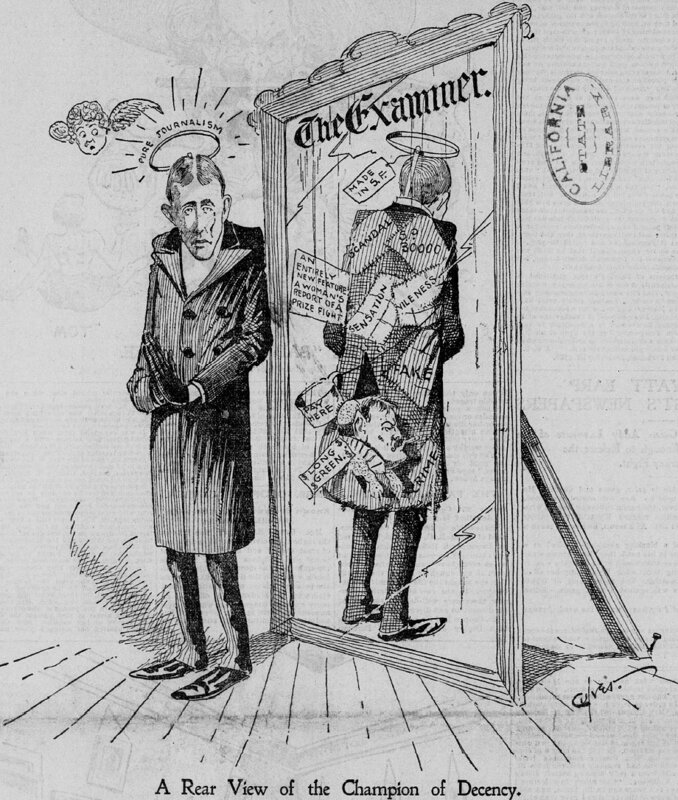 Schwartzman, one of the proprietors of the comic paper Puck, offered him a situation on June 1, 1896, where he worked under the editor Gibson. He was reportedly one of the “best paid artists in this city” but did not work exclusively for Puck. He designed a series of posters for Hearst’s New York Journal, one popular picture being known as “Nankivell’s Dancing Sailor Girl.” He also designed the book-cover for Posters in Miniature, which reproduced the best poster art from around the world. The New York Herald Tribune had been started by Horace Greeley as the Tribune in 1841. Whitelaw Reid took over after the death of Greeley died in 1872. Whitelaw Reid was a staunch militaristic and imperialistic supporter of Theodore Roosevelt. Reid died in 1912 and was succeeded by his son Ogden Mills Reid, who was supported in publishing the Tribune by his wife Helen Rogers Reid, and associate editor Clinton W. Gilbert. Mrs. Reid was a strong woman and is generally believed to have been the “brains” behind Ogden Reid, and exercised great control over the newspaper. Clinton W. Gilbert, who wrote as “The Gentleman at the Keyhole,” was a political writer, who began his career in 1891 as reporter for “the old New York Press.” From 1913-1918 he was associate editor of the New York Tribune. In 1918 he moved to Washington as correspondent for the Philadelphia Public Ledger. He contributed weekly political article for Collier’s Weekly and was author of Mirrors of Washington, and Behind the Mirrors. The toxic crusade against Hearst was meant to destroy Hearst’s integrity and ruin his newspaper empire. Mobs in several cities gathered to burn him in effigy along with his newspapers. His writers, editors, and cartoonists loyalties were suspected of disloyalty and treason. 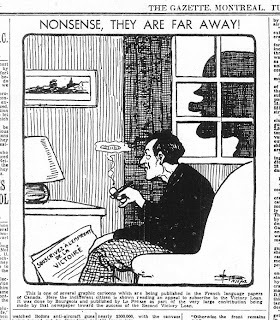 Winsor McCay, disgusted and embarrassed, wrote a public defense of his employer, describing his enemies as “privileged interests and featherbed patriots.” Hearst and his employees were investigated by the American Protective League, a government sponsored vigilante group that helped carry out the “slacker” raids in 1918, raids which were even denounced by the Tribune. Spy hysteria had led to the forming of numerous vigilante groups, many sanctioned by the Department of Justice, who ran roughshod over America, engaging in mob action, beating, torturing, tar and feathering, jailing, silencing, and lynching their enemies. Every vigilante brought to trial was acquitted. 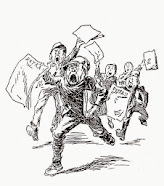 The list was a long one, the American Defense Society (whose honorary president was Theodore Roosevelt,) National Security League, American Protective League, Home Defense League, Liberty League, Knights of Liberty, American Rights League, All-Allied Anti-German League, American Anti-Anarchy Association, Sedition Slammers, Terrible Threateners, Ku Klux Klan, Boy Spies of America, and the Anti-Yellow Dog League. 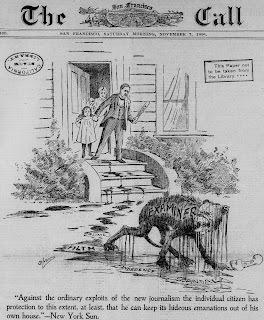 The Brooklyn-based Anti-Yellow Dog League were boy detectives, some as young as ten years old, who spied on their neighbors, listening for seditious comments and handing out warnings. 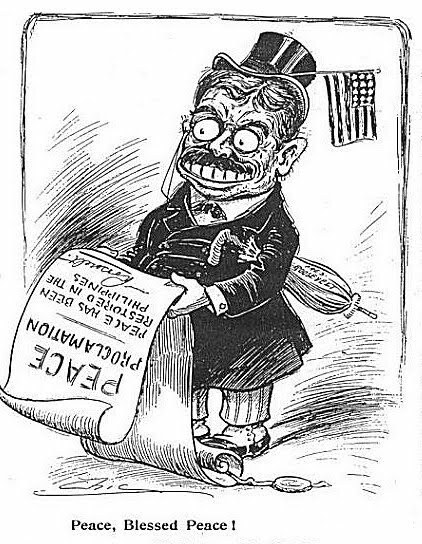 Theodore Roosevelt congratulated the Anti-Yellow Dogs, writing “It is our duty to insist upon a 100 per cent Americanism in this land and to tolerate no divided allegiance.” With the tacit approval of the government, and active encouragement of the partisan press, law and order took a holiday. 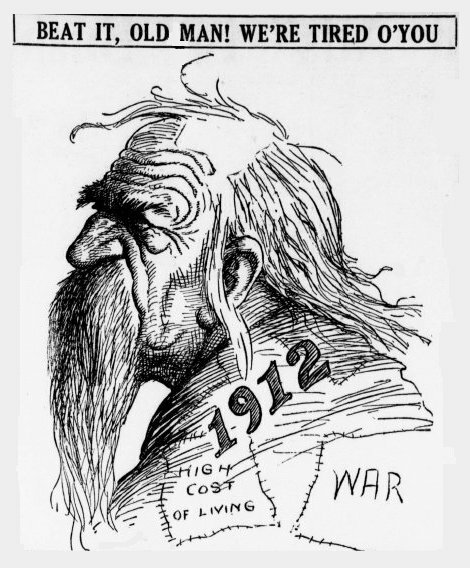 Hearst fearlessly laughed it all off, but in December 1918 a subcommittee of the Senate judiciary held hearings on German propaganda in the United States during the war, and Hearst was crucified in the newspapers. 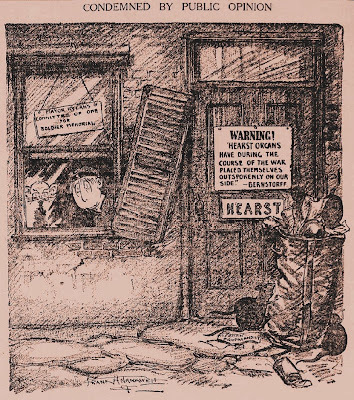 Hearst went into action, creating a Soldier’s Service Bureau on 13 Jan 1919 with offices in the American. Headquarters were in Washington with branches in cities throughout the Union. 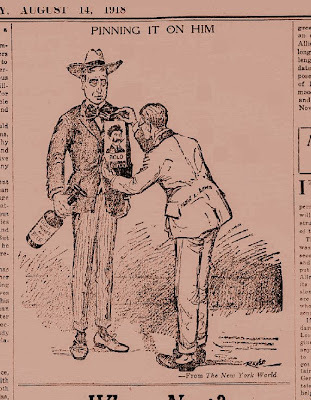 The use of shrewd publicity, advertising, and showmanship, and rising public disgust over the slacker raids, finally brought an end to the campaign to tar Hearst as a pro-German. William Randolph Hearst died in Beverly Hills, California of a heart attack on 14 August 1951. Helen Rogers Reid attended Hearst’s funeral. Frank Nankivell died at Florham Park, New Jersey, July 7, 1959. He had become a renowned book illustrator, etcher, and portrait painter, with much of his work held at The Smithsonian in Washington, D. C.
*Thanks to Rick Marschall and Leonardo De Sá for conversation and clippings. **The New York Tribune for the period can be browsed HERE. Click on images to enlarge, dates for individual cartoons illustrated are in the menu bar. ***The most thorough account of this period is Opponents of War 1917-1918, Peterson & Fite, University of Wisconsin Press, 1957. 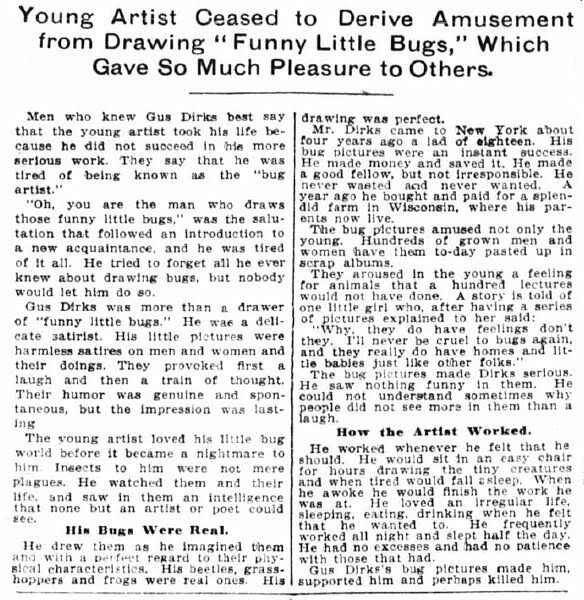 The following article is told by Charles D. Stewart, an acquaintance of Winsor McCay’s, from McCay’s days as a Dime Museum poster artist. Stewart perceives the ‘Gertie’ animated film as foreshadowing the talkies to come. 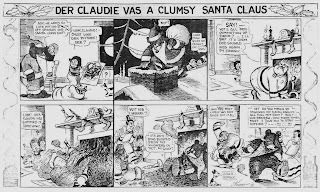 Winsor McCay was actually making new use of the time-honoured patter of the “chalk-talkers,” cartoonists who punctuated their drawing on Vaudeville stages with jokes and witty anecdotes. Chalk-talking cartoonists went back at least as far as the Civil War, with artists like Frank and Dan Beard, Frank Bellew, and Thomas Nast taking the stage in lecture halls and churches across America. 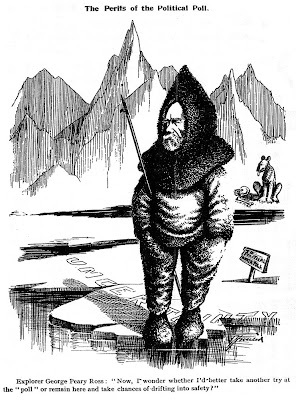 In England Harry Furniss and Tom Merry were “lightning cartoonists” of the stage, and John Wilson Bengough did the same in Canada. By McCay’s time most of the newspaper cartoonists; among them himself, J. Stuart Blackton, and Richard Outcault, participated, usually on the vaudeville stage. 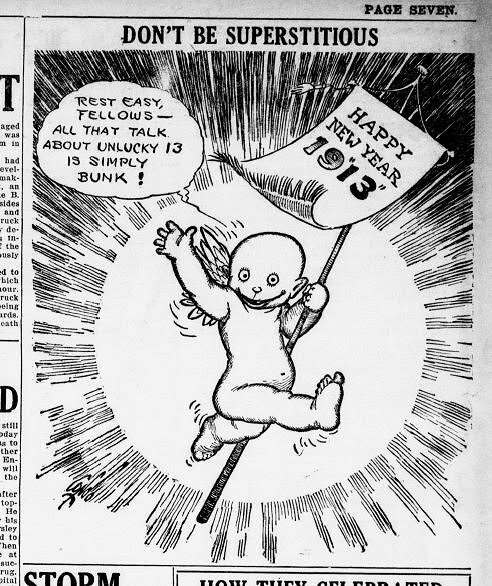 The article also names a man I have never heard of before, the poster artist Merrifield, as an influence on Winsor McCay’s coloring, possibly even on his drawing style. Gertie -- an engaging and homey name. You almost feel as if you had met her. But who was she? What did she do that Winsor McCay, the artist, should put her on the screen? “Come forward, Gertie -- come forward. Stand up, Gertie -- up on your hind legs -- up -- up. Wave your foot at the audience -- that’s right. Dance Gertie -- Give us an imitation of Little Egypt. Now get down on your knees and pray, Gertie. That’s right. Get up.” BANG (the cracking of the whip). The routine was something like that. In private life Gertie’s name was Dinotherium Giganteum, which was scientific language for “terrible big beast.” She was elephantine in her general build and deportment, weighing thousands of pounds. With her great girth, which she did not try to keep down, and her strong pillarlike legs, she was more of a mama than any elephant. She and her relatives have been dead now 3,000,000 years; nevertheless McCay studied her up and brought her forth as a big obedient animal which understood English. That too was just like Winsor, who besides conceiving the animated cartoon, was also verging close to the idea of talking pictures. The picture showed the interior of a circus tent with an arena for performing animals. Beasts of the usual variety sat around on their pedestals while Gertie was seated like an elephant on her big, inverted tub. As I recall it, several of the animals came forth at times and did something of a circus nature, but attention was centered on Gertie, the star of the show. The rest of the circus was just for atmosphere and background. 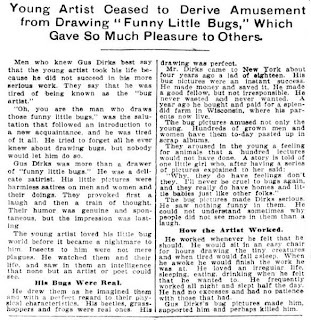 McCay traveled with the picture when he could get time off -- which was only a few weeks at a time -- and he was really a part of it in the sense that he appeared on the stage in a ringmaster’s costume with a loud cracking whip in his hand. It was in obedience to his commands and the cracking of the whip that Gertie would get on and off her tub and do whatever he told her. 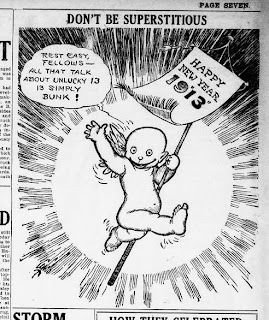 The picture ran for 20 minutes and McCay’s commands were all accurately timed. This was very much as if the ringmaster’s voice were a part of it. Gertie did not have a word to say, but it was evident that she understood the language. And that is the next thing to speaking it. McCay himself, without the assistance of other artists, made all the thousands of separate drawings necessary to produce the film. Nowadays a feature of equal length requires a whole studio full of artists. The principal artist, or creator, makes drawings, showing only the beginning and end of each action; then the subordinate artists, the animators, fill in between with drawings showing successive stages of the action. These drawings are so little different from each other that when they are run rapidly before the eye they seem to be continuous action without jerks or jumps. When the animators have done this the tracers set to work and trace each of the thousands of drawings with ink on specially treated celluloid; after which the work goes to the opaquing department where the pen lines are filled in and shaded with the brush in tones to correspond with the scenes chart. 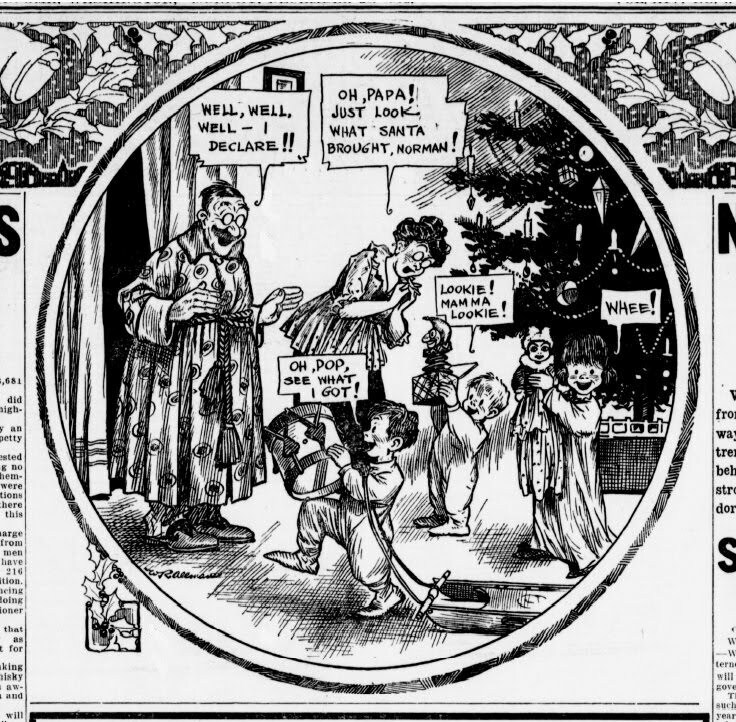 Older readers of the Milwaukee Journal no doubt recall “Little Nemo in Slumberland,” a full page in color, which was a regular feature of the Sunday edition. It wsas more delicately colored than the usual comic. Little Nemo, a small boy in his white nightie, wandered through the marble halls of dreamland. He was usually in some pillared palace whose tall, colored columns rose about him as though they were supporting the sky, and there were deep perspective effects in which McCay was a master. The full page feature was in oblong squares showing Little Nemo’s progress from one part of his dream to another. It was only a step -- though a long one -- to the thousands of pictures necessary for an animated cartoon. Winsor Zenic McCay was born in 1872 at Spring Lake, Michigan, where his father was a lumberman. While still a boy in elementary school he decided to cut out education and start doing something -- so they put him to work in the sawmill. In his teens he pulled out for Chicago, where he started taking jobs as a sign painter and all-around artist. He had always had an inclination for drawing. He painted street signs and made hand colored posters for show houses, and for awhile he got employment in a pine engraving and printing establishment, which made posters for circuses and other billboard purposes. His jobs did not last long. For a few weeks he went to an art school, and that was all. He was mostly self-taught. His great chance to make an artist of himself came one day in Cincinnati when he asked John Avery for a job. Avery was manager of Kohl and Middleton’s dime museum on Vine street, one of a chain of 5 museums (three in Chicago and one in Minneapolis,) which were rapidly making heir owners wealthy. On the top floor was a complete scene-painter’s studio with a great array of scene painter’s colors and the best brushes that money could buy. There were wooden frames of all sizes to hold the stretched muslin -- glue with which to size the muslin and make it tight as a drumhead when dry -- a bucket of distemper white with which to prepare the surface. And then the colors! They were the regular theatrical scene painter’s outfit. In a V shaped trough about 10 feet long, with partitions to keep them separate, and they ran the whole gamut of color from the white, the cream, the buff and the yellows through the greens and reds and blues and browns up to black. What a place for an artist to swing himself! And John Avery needed a man. 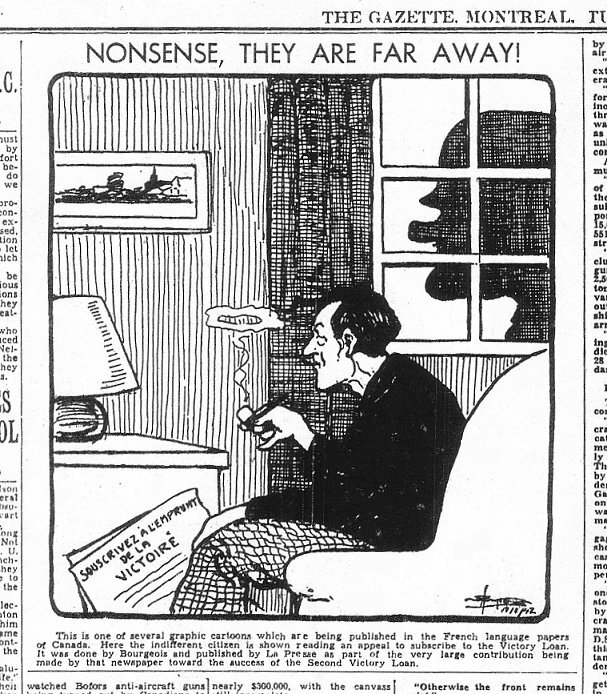 Winsor McCay was told to go upstairs and see what he could do, and he did. While he was not yet a finished draughtsman, nor the most skillful of colorists, he was on his way. He had imagination, and he liked the sort of subjects that could give it scope. This a dime museum provided -- the freakish, the unusual, and the bizarre. The public took to his work. So he had a steady job, steady wages, and a free hand with the brush! He could buy anything in the way of color that he needed; the museum was lavish of money in that regard. Carmine, that most expensive of pigments, they bought by the pound and kept in a glass jar with a ground glass stopper. 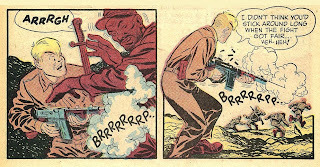 And this was the beginning of a great cartoonist and the most refine colorist of the comic supplements. 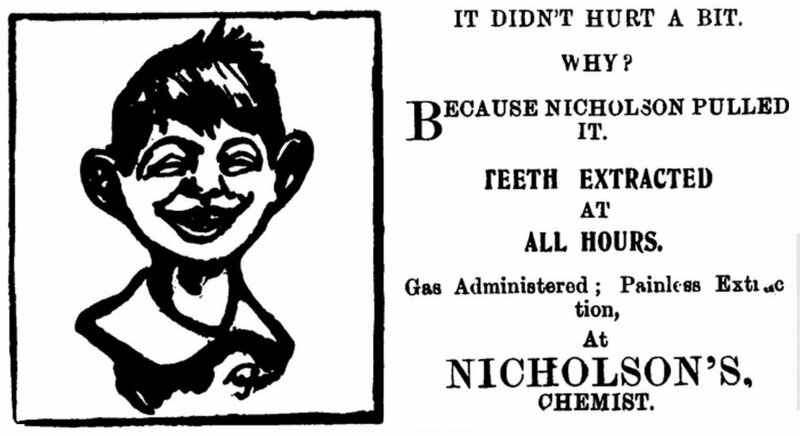 Of all McCay’s career this is the period that has interested me most. It was then that I became acquainted with him, and spent most of my time for two weeks in his top floor studio. 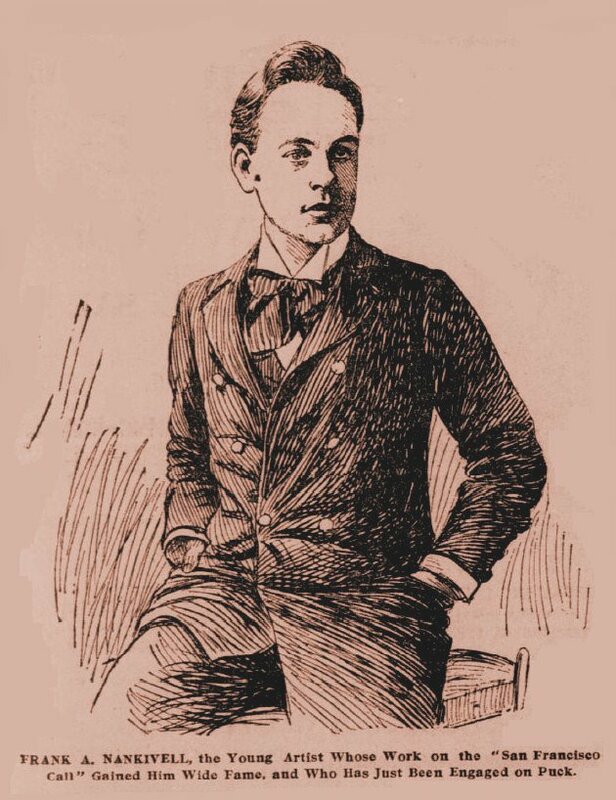 At that time -- 1890 -- McCay, at 18 years of age, was just well settled in his job; and our similarity of interests made our acquaintance prosper. In July of that year I came along to work in the museum -- not as an artist but as the main attraction in the “curio hall.” As to what I was doing there, let it be told in the words of the modest and retiring press agent -- I was the “mnemonic, orthographic, linguistic, phonetic wonder of the age.” In other words I did things with language which amazed the public. On the Monday morning that I arrived, with a grip in my hand, I was astonished to find what the artist had done to the museum front. The whole lobby and the two corners outside were covered with imaginative depictions of myself -- all except one printed poster announcing Howard’s minstrels. While McCay had no real knowledge of what I did he put his imagination to work. A big upright picture which interested me was that of a man talking into a phonograph: and the machine was exploding -- a blast of red and yellow flames and pieces of machinery escaping in all directions. The language was too much for it. Other pictures were equally astonishing. Certain circumstances brought us together. As I was no curiosity to the public except when I was performing, and as I performed only seven or eight minutes out of every hour, I had most of my time to myself. So I rambled upstairs and spent the greater part of my two weeks with Winsor McCay. For three years I had worked among artists, being an apprentice wood engraver who made illustrations for books and catalogs. McCay was interested in that. Then too, I knew considerable about color. Most important of all I was acquainted with the work of Merrifield, a really talented artist who made the fronts for the Clark Street museum in Chicago. He was so good that lithographers and other commercial artists would visit the museum on Monday mornings to see what Merrifield had done next in the way of coloring. McCay, in his days in Chicago, had been attracted by the museum -- he was a natural showman himself -- and he had learned much by studying Merrifield’s ideas and his knowledge of color combinations. So the two of us had much in common to talk about: and in 2 weeks we were pretty well acquainted. From knowing him so well this early in his career, I followed his doings with interest to the day of his death. When he came to Milwaukee along with Gertie I went in to visit him, and we had quite a reunion talking about our adventures, years before, in the days of the dime museum. After McCay had advanced in his draughtsmanship by working in the museum, and had attained some fame, his fancy turned to newspaper drawing. He worked for a time on two Cincinnati papers, and then, in 1902, he went to New York. Here his cartoons were an immediate success. He was employed on several big New York dailies, going from one to another with advancing salary and increasing fame. He had the respect of his fellow artists and was popular generally; he was a prominent citizen. He belonged to the Lamb’s club, the Friars, the Freemasons, the Inner Circle, Cavalry Post 101 of the American Legion, the Royal and Mystic Order of Elephants, a fraternal organization of the Brooklyn navy yard -- and possibly others. And when he died, on July 26, 1934, they loaded him with flowers. *I have been unable to trace the intriguing Chicago artist “Merrifield,” but I can point out who he was not. He was not Richard Forrester Merrifield of Keene, NH, essayist, novelist, editor, artist and musician; he was born too late, in 1905 and died in 1977. Nor was he the artist Mrs. Ruby Merrifield, who at the age of about 20 began painting signs for her father’s bottling plant in Miami. *UPDATE: Gene Meier and Peter Hastings Falk, who publishes WHO WAS WHO IN AMERICAN ART have identified the Chicago artist as Rube Merrifield. Photos of the artist are HERE. **Vitagraph Illustration at top from Ebay. Volume I Number 1 of “The Moon” was launched on 28 May 1902, with a quote from Dryden. “There is a pleasure in being mad which none but madmen know.” The Moon was published in Toronto, Ontario by Moon Publishing Company, until 18 July 1903. 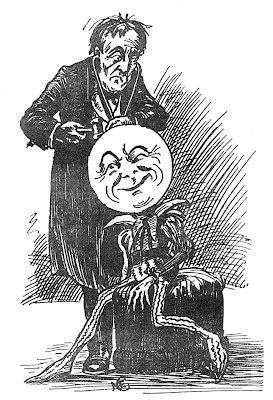 The Moon was blatantly Imperialistic (except when the Imperialism was of the American sort,) violently anti-American, and filled with grotesque racist caricatures of Irish, African, and Native-Americans, all beautifully drawn by the most famous Anglo-Canadian cartoonist at the turn of the century: Arthur G. Racey, using the pseudonym “Chic.” Less offensive contributions were made by cartoonists and illustrators Newton McConnell, Sam Hunter, Fitzmaurice, C. W. Jefferys, and John Wilson Bengough. Despite the quality of illustrations The Moon never made much impact outside of Toronto. Few Canadian publishers could withstand the combined barrage of publications from Britain and the United States then littering the newsstands and cigar shops. 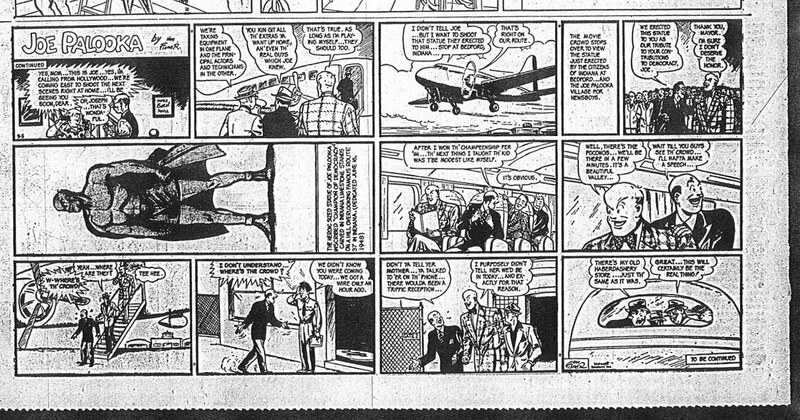 Comic strips, except for a brief flourishing in French Canada, lacked the sophisticated syndication of the American comic supplements, and remained short-lived regional aberrations. 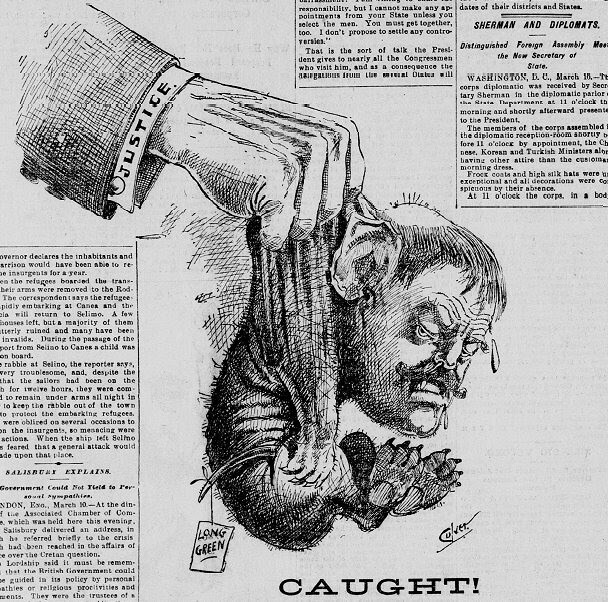 Editorial and political cartoonists fared much better in newspapers and Canadian magazines. 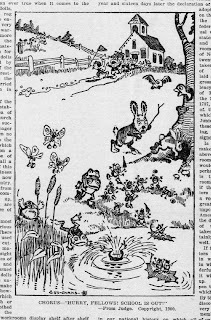 Racey’s cartoons, for instance, appeared in the Chicago American, The Canadian Magazine, Le Monde Illustre, The Metropolitan, The Owl, Le Canard, The Montreal Witness, The Montreal Herald, The Toronto Star, Toronto Saturday Night, Grip, and other publications. 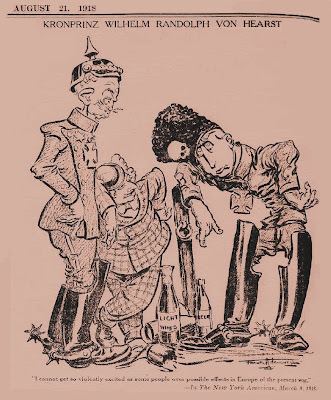 Racey also did much advertising material for Irving Cigars, a series of cartoons featuring the “Man from Mars” and another series “Pickwick Up-To-Date.” These were published all over Canada, in the Manitoba Free Press and Lethbridge Herald among others. 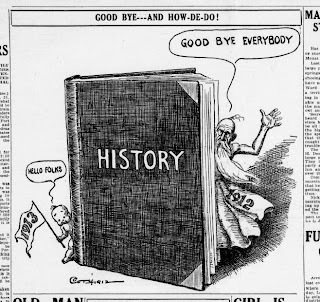 In 1915 he was doing political cartoons for the Family Herald of Montreal and during the thirties his cartoons were appearing in the Grain Growers Guide, home to Doo Dads cartoonist Arch Dale.